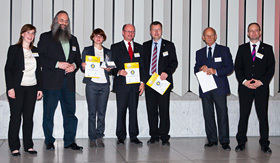 Dieter Schenk, CEO ZinCo (3rd from right) with the award winners and, from left, Florence Aeschelmann and Michael Carus from the nova-Institut GmbH, organisers of the event. ZinCo innovation award “Bio-based Material of the Year 2014“ for its green roofing system “natureline“ manufactured from renewable raw materials. ZinCo has been awarded third place in the innovation competition “Bio-based Material of the Year 2014“ for "natureline“, its green roof system based on renewable raw materials, unique worldwide. Admittedly, third place doesn’t initially sound very exciting. However, the significance of this award becomes clear when you consider that it is awarded from the most important platform in the world for bio-based materials. And, the award is not only for the recipient, ZinCo, that has always stood for innovation and sustainability, but for green roofing in general. This is because the 180-plus participants from around the world who came together at the 7th International Conference on Bio-based Materials in April in Cologne were very impressed with this topic and its potential. The participants at the conference in Cologne, who also adjudicated the award and who certainly count as the “Who’s Who” in the world of bioplastics technology, can be considered to be a multiplication factor and will provide a really strong boost to the introduction of bioplastics into green roofing. As a result, the aim of manufacturing the functional layers required for green roofing on a fully environmental basis has become a reality. By the way, first place in the Innovation award for the "Bio-based Material of the Year" was awarded to the company Q-Milk for a textile fibre based on casein, and second place was awarded to the company Fischerwerke for a bio-based injection mortar that can withstand considerable force. The protection mat, filter mat and drainage element that are part of the “naturline” green roof system will in future be based on bioplastics. The basic materials are grown in line with strict statutory requirements that take both social and environmental standards and the protection of the environment into consideration. All the bioplastics we use meet the strictest quality requirements demanded for their use in a green roofing system – without any loss. Therefore, we are successfully saving fossil resources, reducing the greenhouse effect and protecting the climate thanks to the use of bioplastics.